It is, at its simplest, an ex-monk’s act of faith. After eight years in a Trappist order—and just prior to taking his vows—Don Justo Gallego Martinez was obliged to leave, considerably weakened by tuberculosis. Without formal permission or permits, Don Justo began laying the foundations of a great cathedral with his own hands on a plot of land bequeathed to him by his parents. Today the frame of a large building, with a 40-meter-tall dome modeled on St. Peter’s in Rome, towers over the town of Mejorada del Campo. 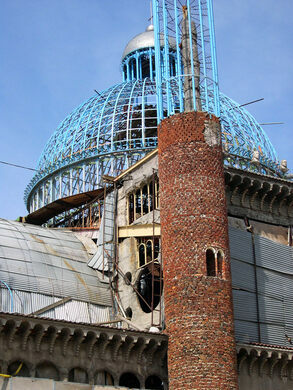 Like the cathedrals of old, it will not reach completion during the lifetime of its 81-year-old architect. What will happen to the building after Martinez’s death remains an open question. No one has yet stepped up to take over the project. Practically all building materials are scavenged or donated by local construction teams. Looking around, one can see columns made of concrete-filled plastic buckets or air ducts and stairs whose lips are formed from coils of wire, among other things. Of course, piles of building materials—concrete, brick, rebar, even newspaper—line every wall and fill every nook. Though many of the stairwells are partially blocked by stacks of pipes, it is still possible to reach the roof for the best view of Mejorada del Campo. Don Justo’s rough vision for the completed cathedral includes two narrow spires to reach almost twice as high as the roof of the edifice. 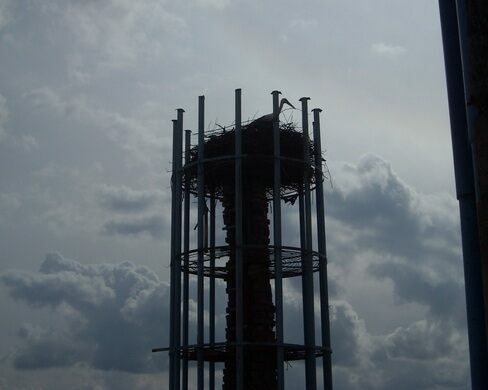 Completing these may prove difficult, as some white storks have made nests on the in-progress spires. From Madrid:The interurbano bus #341 leaves from Conde de Casal every 45 minutes. The stop named Calle de Arquitecto Antoni Gaudí is right in front of the cathedral. Bus fare is €2.